Mission Planning, Coordination and GPS Navigation for those who Work and Play "Off the Grid" LEADNAV GPS is a highly developed, professional-grade package for Military, Law Enforcement, Search and Rescue, Special Operations, Off-Road Racing, General Off-Roading, Hiking, Biking and anyone else looking to improve Planning, Coordination and Navigation in an "Off the Grid" environment. 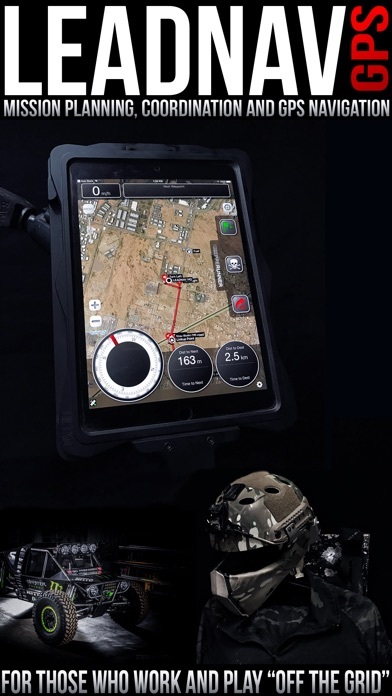 LEADNAV currently provides full mission packages in the form of Software, Hardware, Training and Consulting for those operating in some of the harshest conditions and environments imaginable... Used by Pro Racing Teams and other Professional Organizations World Wide! More Powerful than any other GPS on the Market! Features: • Plan, Organize, Coordinate and Execute Trips, Events and other Professional Operations. • Create or Import Collections of Routes, Tracks, and Markers for different events. 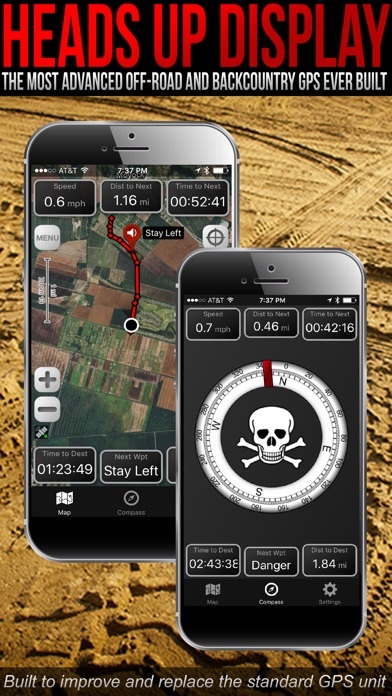 (Baja 1000 2015, Mining Expedition 2016) • Share individual Routes, Tracks, and Markers amongst your Team or Group. 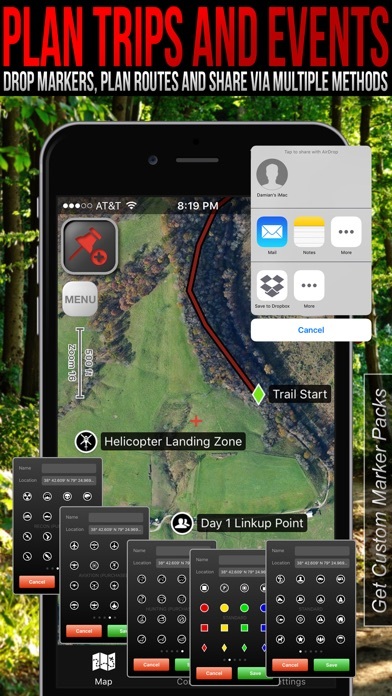 • Easy to use point to point Route Planning Interface. Plan your route and go! • Drop audible warnings and non-audible Serpentine points to keep you on track. • Record tracks to display where you have been. So you can hit the trail again or find your way back. You can also convert your tracks to routes. Track Stats for each trip. • Highly advanced Team Location Tracking through our cellular/wifi, Gotenna (VHF device) and Iridium GO! (Satellite device and our service plans) • Reverse your routes. Hike to the top and then reverse the route to hike back down! • Drop Markers to identify places of interest or to document the experience as you go. Vehicle, rally point, boat dock, deer, or anything else you want to find again. • System functions on the GPX file standard • Free Map Sources include Bing, OpenCycleMap, OpenStreetMap and support of offline mapping options like MBTiles • In-App Purchase allows access to additional maps (Mapbox Satellite, Mapbox Terrain, Mapbox Streets), and access to your own URL entry. 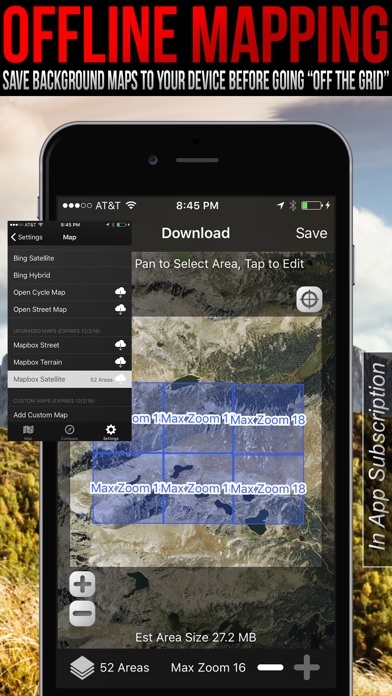 Create, cache, and delete maps with your custom URLs (Part of the In-App Subscription). • Offline Mapping for areas with no cellular coverage. (In app purchase) Select and store desired areas of the map for offline use. Download those maps before you hit the woods! import and export of MBTiles with zipped files. • Compatible with Bluetooth headsets and speakers for eyes free navigation. Throw your device in your pack and GO! • Voice Prompts automatically adjust for the current speed. Siri now reads the waypoint label names as you navigate. “Big freaking rock on the left!” Get creative with the names to make the most out of your experience. • Automatically adjusts your audible (Red) Turn Warning and (Blue) Waypoint Proximity rings based off of your current speed. Giving you the information you need when you need it. Audio Guidance Examples: “Slight Left in 450 meters” ...... “Slight Left” “Danger in 500 meters” ....... "Danger" Additional In-App Purchases: (See website for all subscription details) - Upgraded Maps Subscription ($20 a year minimum requirement for saving background imagery/maps) - Advanced Pack Subscription - Pro Pack Subscription * Built for Professionals and Event/Race Prep Teams * Pro Editing Tools and Features - Recon Markers - Hunting Markers - Aviation Markers Note: • This is a high powered GPS device and requires power connectivity for prolonged use in the field. • Mobile devices that are WiFi only do not come with an internal GPS. An external GPS will need to be used along with the application. • The capability to save satellite maps/imagery to your device for "off the grid" use is an outside service and requires an In App Subscription to MapBox Battery Life Disclaimer: Continued use of GPS running in the background can dramatically decrease battery life. This app has completely changed how I plan my off road adventures. I used it for a 2500 mile Baja adventure, and was able to create daily routes from stop to stop. 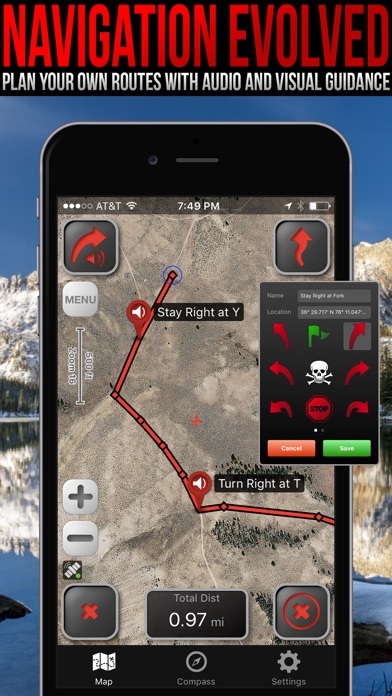 I do a lot of off roading in the Western US and pre plan my routes with this app. There is a learning curve, but they have great videos on their website to help. I gladly upgraded to the pro version and the $120 per year is a spit in the bucket for the function/features you receive. I raced in several Baja 1K’s and NORRA M1k. I fought with lowrance god units every time. Using an IPad is so much better, and there are SO many more features with LeadNav. Trying to map out the desert for offline use is a grueling process. Takes a $20 per year in-app purchase if you want satellite imagery. Zooming in beyond your pre-loaded resolution will result in the map rendering itself blank. Marked trails are not able to be overlaid onto the satellite map. Even pre-loading non-satellite maps to show marked routes requires the same process as the satellite maps and has the same issue of zoom/resolution blank rendering. Would require hours of work to preload a large area. I'm sure it's a great app for racers with detailed, planned routes who pay the $150 per year. It's not a good app for weekend warriors / exploring unless you are willing to pay extra and spend hours pre-loading your planned area in small increments. We use LeadNav on a regular basis for racing and it’s the best on the market. I got drawn for two hunts here in Arizona and decided to use it on my phone for tracking me and marking spots. My guide was blown away. Thanks LeadNav!! We use LeadNav exclusively for all our route development and durability work with many vehicle manufacturer durability tracking. Still not sure of the app. Looks nice, but three different iPads and I cant plot a route without the app dumping out of it! Also not sure the price and all the add on's are worth it. Bit pricey. Hope this closing on its own gets fixed or I may need to go back to my Google app which has been extremely reliable so far. Can't see this being that good for military use! The stuff we used was way better. You guys are killing it with the new updates. I can't wait for the off the grid group tracking. I hope it's all released by the upcoming 50th anniversary of the Baja 1000. Keep the updates coming guys. I really love the new location tracking feature!